At Poughkeepsie Yacht Club - That's All Folks! After looking at the tide and current charts, we decided to leave Manhasset at 5:30 am to catch the last of the ebb tide at Hell Gate and then the beginning of the flood tide up the Hudson River. If everything went according to the charts, we would have current with us all the way from Manhasset to PYC (ha!) So I rolled out of the bunk at 4:30, took Hoolie ashore, returned and got the boat ready and we did get off by 5:25. On the way a large barge passed us by the Throgs Neck bridge doing 9 kts. Okay with us, we dropped in behind. But then he suddenly slowed down to 3.5 kts. 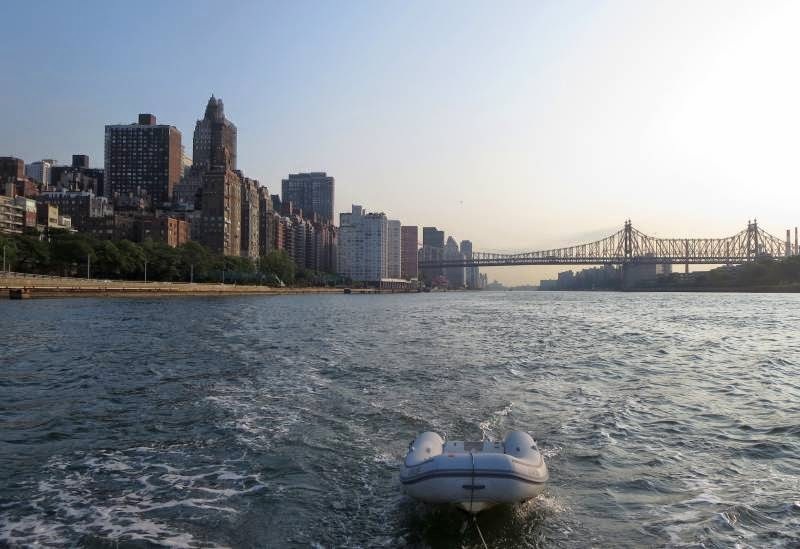 We hailed him on the radio and he said that six barges all in a row was coming up the East River to pass through Hell Gate at about the same time we would have gotten there. He slowed to allow them to clear Hell Gate. 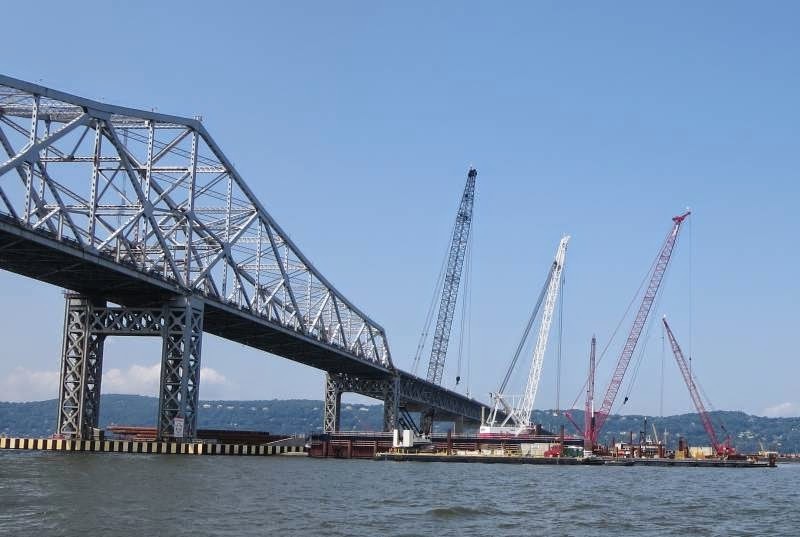 However, in order for us to utilize the flood tide up the Hudson, we had to press on - so we did. We met the six barge convey right at Hell Gate! I squeezed over to starboard as far as I could, carefully watching the chartplotter and my depth sounder. The first barge appeared to head right for me but I knew he had to make a hard turn to starboard to make the Gate. Well, he did and I did. Now I was lined up for the East River and saw the rest of the barges, all in a row. Except, what was that on the right - it was another barge, a rather small barge that had pulled over to my side of the river to let the larger, faster barges cross. Now the narrow East River had two barges side by side headed up river with one of the barges headed right at me! So I move over even more, just 20 feet or so from the morning joggers along side the river. Happily, the small barge moved over just enough for me to pass. I'm sure he was just as unhappy to see me as I was him! After passing the last of the six barges, we entered the wider section of the river by the UN building. Nothing like a little excitement in the morning. Now we had to contend with the multiple water taxis that have seemed to proliferate these past few years, a couple of dozen going in all directions not to mention the ever present Staten Island Ferries. Rounding the Battery - where was my flood tide!? I saw a 2 kt current against me instead of at least a slack tide. I didn't see a favorable tide until the George Washington bridge. After that it started to build. By the time we reached West Point, we had our 2 kts of current with us. Coming into PYC, we called for help and was greeted by the Steward, a very welcomed sight. Ann was at the helm and managed the boat but had to contend with a kt of current behind the boat along with 17 kts of wind, also on the aft quarter - and, by the way, we now have a boat just ahead of us on the end dock, about five feet away from our bow, not much room for error. However, Ann has been doing all the boat handling recently and I handle the lines. She's as good as anyone I know, experience pays off plus she's cool under pressure. Richie, the Steward, caught our lines and we secured the boat! We made the trip from Manhasset to PYC in 11 hours, 30 minutes. To celebrate we treated everyone to dinner at Eveready Diner, lots to eat. It is now calm and we'll turn in for the night. Friday is unloading day and over the weekend we'll get the boat ready for hauling and fixing up for the trip south in September. The job done by McDonnell Marine was outstanding on the engine, no more oil leaks and the engine is smooth when put into gear (damperner repair). We are ready for the ICW. Join us on September when the regular blog will restart for our trip to Key West and return. Today we went sailing, but there wasn't much wind so we had the sail and diesel. There are a lot of sliver fish, you can see their fins pop up. To me I think that they're tiny little sharks swimming in circles. We saw a lot of ferries when we left our anchor spot they made a lot of wave, I love to bounce on the huge waves. Bye Sarah. Manhasset was deserted on a Wednesday afternoon. We had our choice of the 20 free moorings, only four were taken. 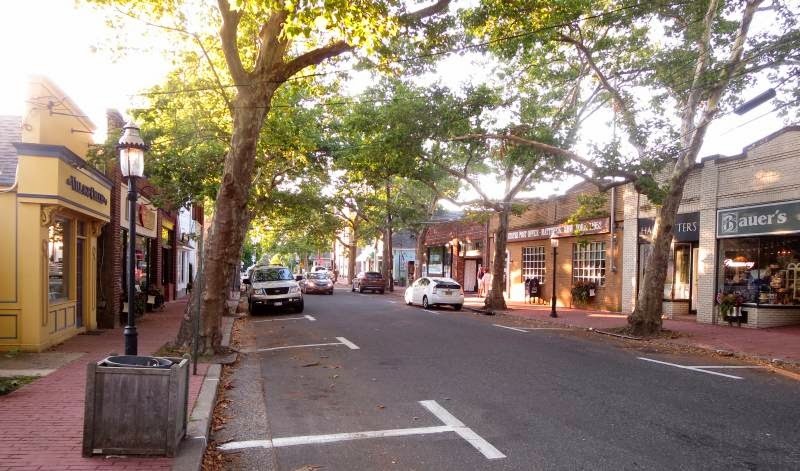 What a contrast between Port Jefferson and Manhasset. PJ has no free moorings, no public dinghy dock and in general is not welcoming to transients. Manhasset is just the opposite! They have two free dinghy docks with the second one being right across the street from a huge Stop and Shop supermarket. 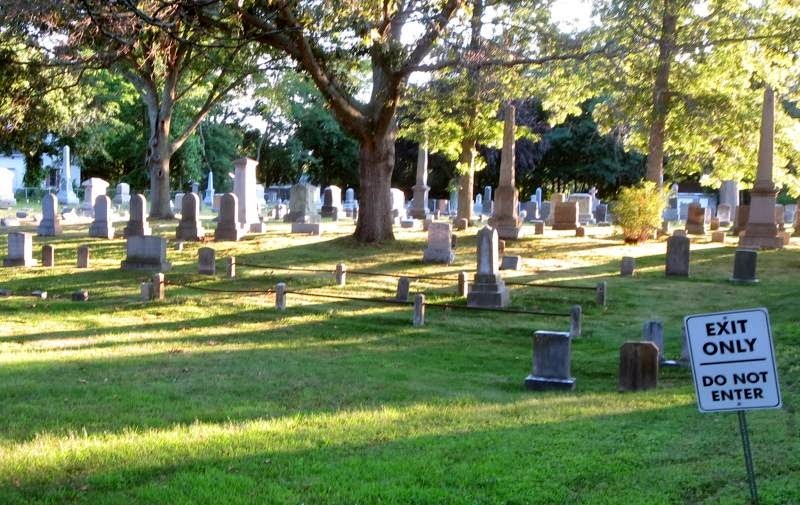 One town is going to prosper and the other will die off. One wonders what is going through the city fathers' minds at town meetings?? At last we had a day of sailing! The storms subsided last night and the winds calmed down so much that it almost was too calm. We left Milford with only 7 to 8 kts of wind but as we got about 1/2 way, the wind picked up to 10 to 12 and the angle was enough to generate 6 kts or so of speed. The entire crew got a chance at the helm. Once we arrived at PJ and found it empty. We chose our favorite spot in the western anchorage by the north shore within 200 ft of Hoolie's beach. On this cruise, the kids get their own lunch and make lunch for us too. Ann cooks breakfast and dinner. For the first time ever, their parents (Monique and Philip) are childless at home for several days. Likewise for us in the opposite sense. 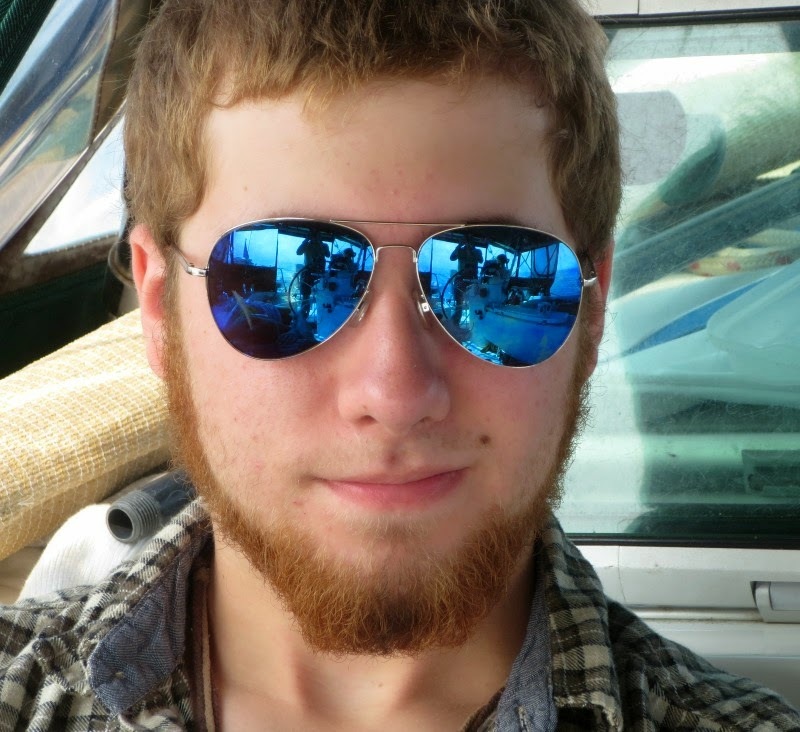 It's quite a change but fun. So it was to the beach to explore for shells, have a meatball and spaghetti dinner followed up by a return trip to the beach to build a fire for S'mores. Then it was back to the boat to watch Pirates of the Caribbean on our 32" LCD TV. The kids really have it rough on the boat. 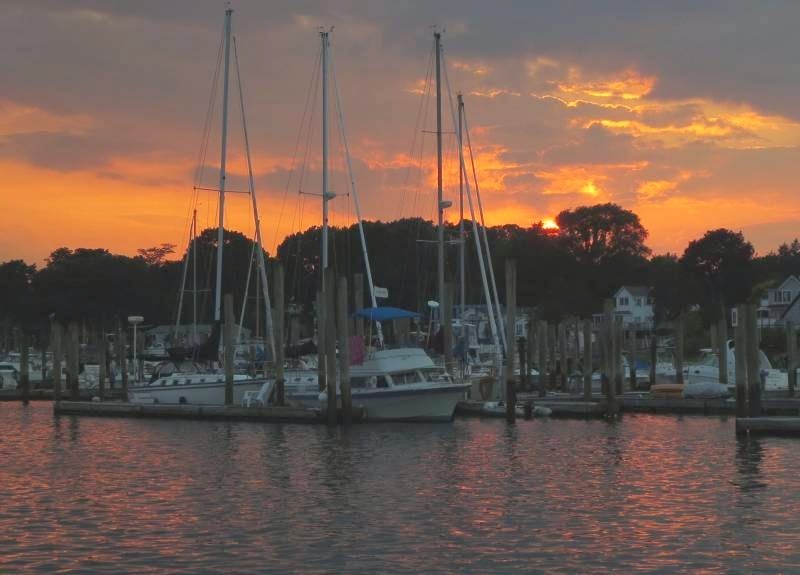 Wednesday will be a longer day as we make our way west to Manhasset for a free mooring. Given the light winds predicted, it will probably be a motoring day. It's a nice area. We took several dinghy rides with the crew. As you can see, we stayed in Milford. NOAA issued a small craft advisory with gusts from 25 to 30 kts until midnight Monday. On top of the wind speed, it came directly out of the direction we would have to take to reach Port Jefferson, but then what else is new?! We used the UConn site for access to the weather buoys to confirm the predicted wind speeds and wave heights. We have often found that the lulls experienced in harbors give you a false sense of security in heading out to the open Sound. As you round the corner into the Sound, the wind suddenly picks up and the harbor lull is no more. 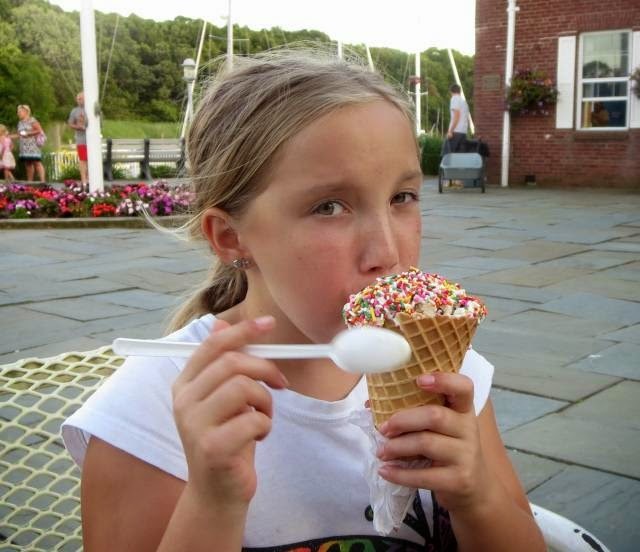 So once again we visited Scoopy Doo's for ice cream which has become a favorite of the kids. On Tuesday morning we'll once again visit all the sites for the weather. We'll head either for Port Jefferson or Northport, depending on how much of an angle we can get on the wind, the goal being to sail, not motor. On Tuesday we're expecting northwest winds, good for crossing the Sound heading south. For the first day out, we only went a short distance with our new crew, just over to Milford. It's only about 12 miles or so. Still we got rained on but there was no lightening. All the crew got a chance at the helm, navigating with the GPS and steering the boat. One has to watch out for crab pots and, of course, other boats. Milford is a small town with a very busy main street. The main attraction is the Scoopy Doo Ice Cream Shop. It's only 200 ft from the dock and the kids flock to it. Grest home made ice cream. There 's also a great marine store (not West Marine but very good) and a small convenience store. Of course there's lots of restaurants but we're eating in tonight given the kids. Today we made pizzas for lunch , I put a lot of cheese and pepperoni and sauce, yum. Also we did a dingy ride today, I got to steer the dingy. It is a whole lot easier than my first time steering the dingy. Sarah. Well, impressions from two of the crew... Looked like they had fun. 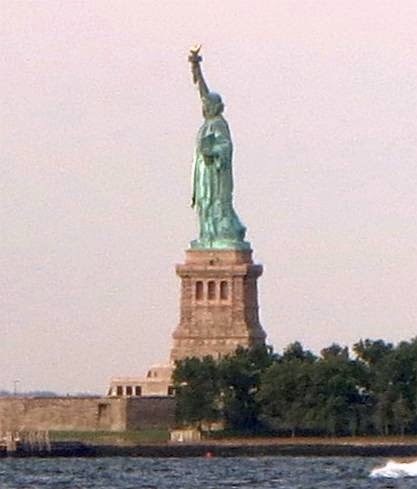 On Monday we're headed for Port Jefferson on the other side of the Sound and anchoring out. There's an island to explore and perhaps some swimming. It will be Natalie's first time crossing the Sound. Well the time as come. It's grandkid week for the next five days! The trip over from Mattituck was rougher than we expected with 10 kts winds (against the tide?). Either it really was rougher or we've gotten too used to the calm ICW. It's probably more of the latter than the former. Around 2:00 the invasion started and we loaded up - with the boat dropping an inch or so further in the water. Amazing what you need for five days.... We celebrated with another dinner at Lenny's, the best fried seafood on the coast. We plan on making the first leg short, just to Milford and a dock just to test the sealegs of the new crew. If all goes to plan, we'll cross the Sound on Monday and proceed west. 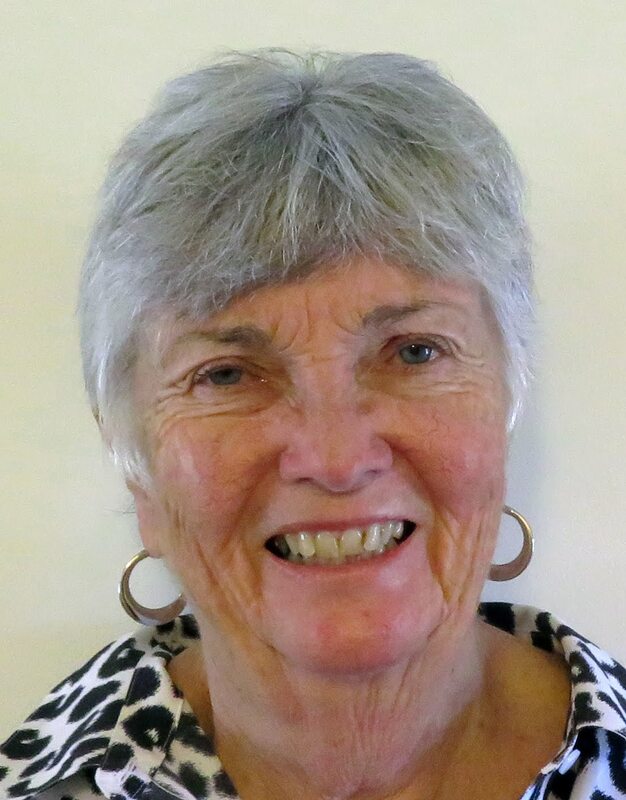 We are getting grandkids on Saturday for the next week. That requires a little preparation so today was "getting ready day". Mattituck is unique among the anchorages in Long Island Sound in having a real supermarket (Waldbaums), a large laundromat and a first rate hardware store all within walking distance (less than a mile). 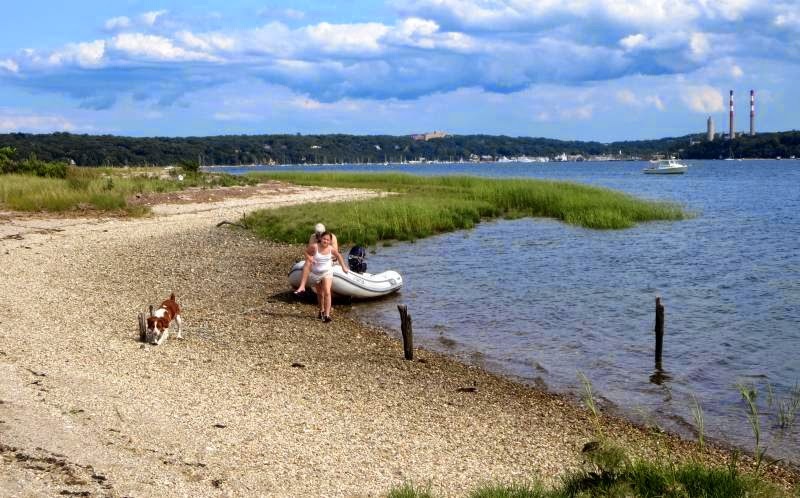 No other anchorage in Long Island Sound can make such a boast. The marina next door is also handy for picking up ice and other boating incidentals. So it was cleaning, laundry and loading up on groceries for today's activities. In addition to the above, the town also has a large complement of restaurants, wine shops, cheese shops and book stores - something for everybody. 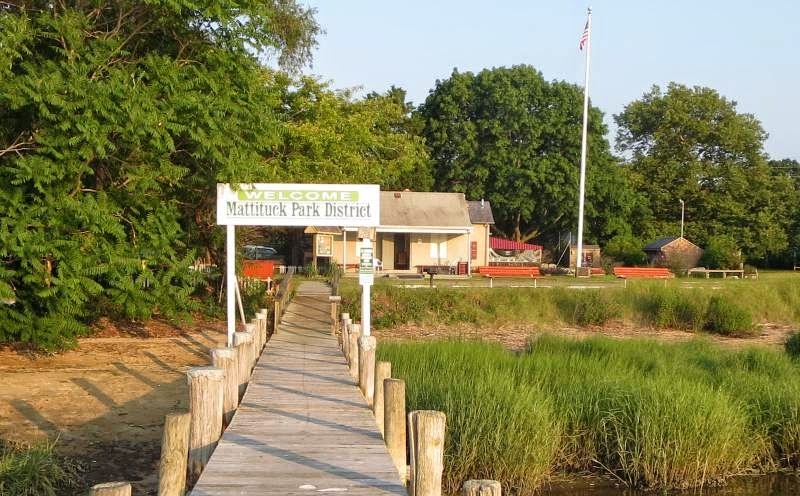 You can see why we make it a point to always stop in Mattituck while in the Sound. On the other hand, the anchorage can get very crowded Fridays and Saturday nights. It seems that many of them have never anchored before. When I asked the captain next door (a few feet away) how much anchor line he had out, he replied, "I don't know". The winds are predicted to be around 5 kts so we should be okay, not like in Maine where all the boats in an anchorage will go around in circles as the 12 ft tides come and go. Here we seem to point pretty well in one direction all the time. 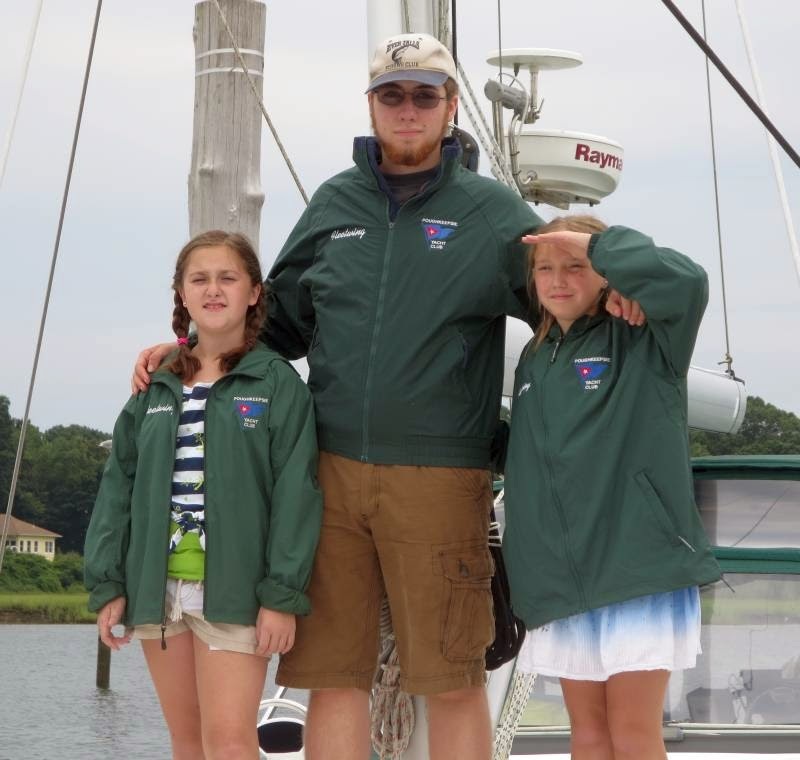 We'll head out to Branford on Saturday morning to pick up three of our grandkids: Matthew, Sarah and Natalie. 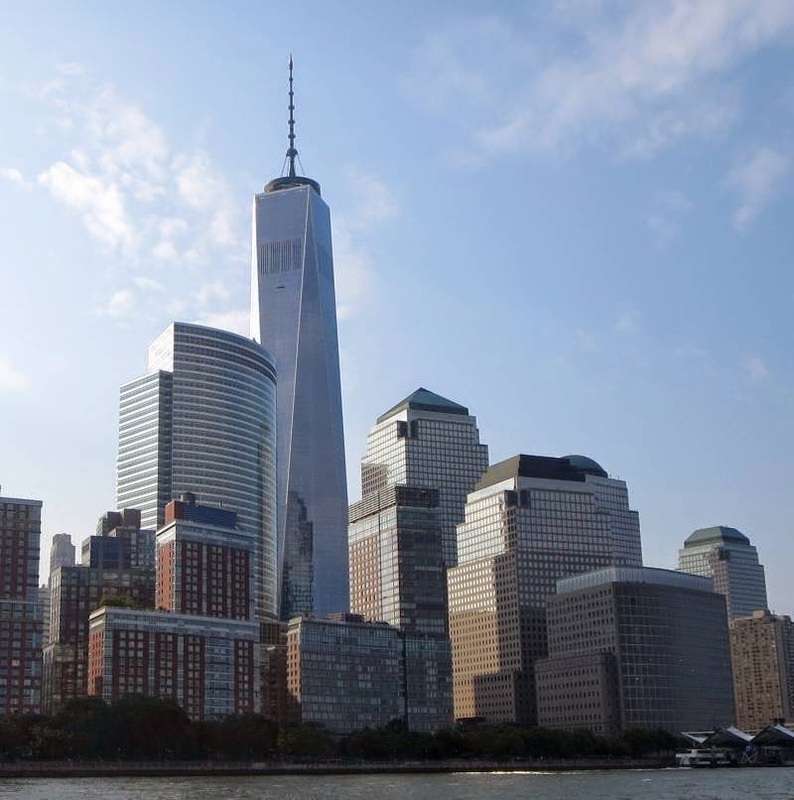 We'll head west, stopping at Port Jefferson, Northport, Manhasset and then hone to the Poughkeepsie YC by Thursday. What an adventure, for them and for us. There was a promise of wind in the morning and the radar looked clear of storms so we headed south to Mattituck. 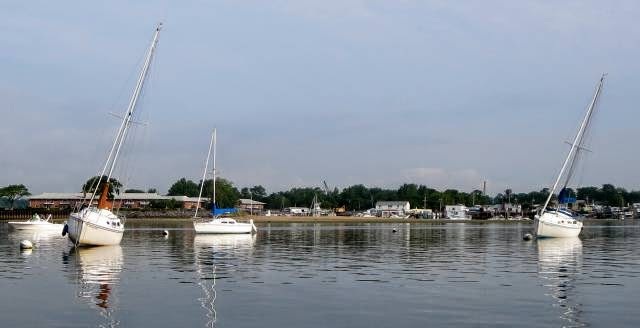 It's across the Sound on the Long Island side and has an anchorage dedicated to cruisers with a dinghy dock for town access. The anchorage is rather small but we had plenty of room when we arrived with only two boats present. However, as the day progressed, the numbers increased. We now count six boats anchored, a couple closer than we like, we'll see what happens tonight. The main street is Love Lane (of all names!) and has all manner of small shops, very interesting to browse. So we walked around and explored. So far, the only times we've paid for a place to stay is at Branford where we needed work done on the engine, otherwise it's been either at anchor or on a free mooring. 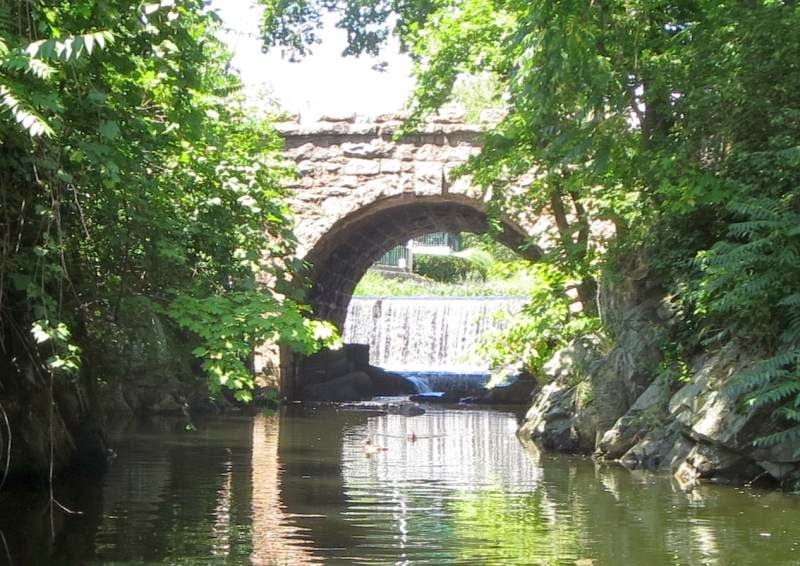 We'll probably stay here Friday too and move on to Branford to pick up the grandkids on Saturday. They will be with us until our return to Poughkeepsie YC on Thursday. Three kids on a boat! Should be fun. 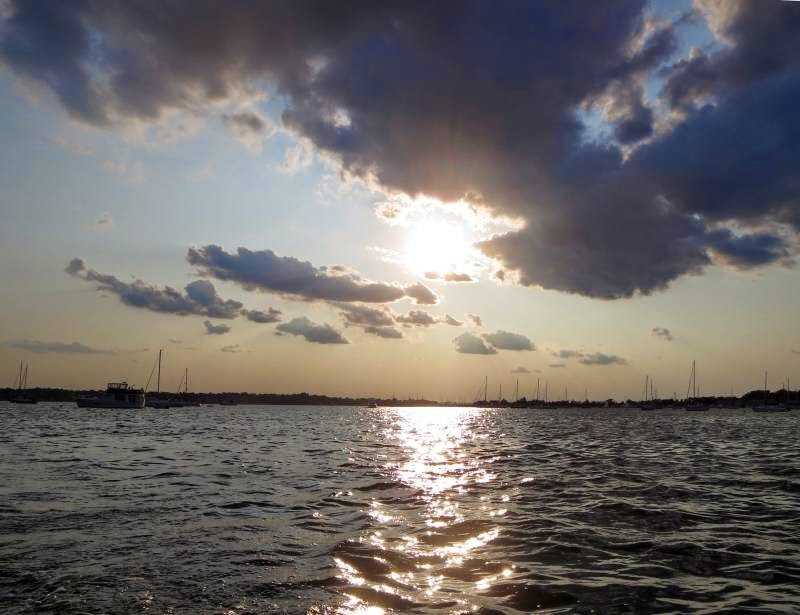 We had intended staying overnight in Stonington to weather the storms headed our way but when we looked at the morning forecast it appeared that the storms had been delayed until very late in the day. 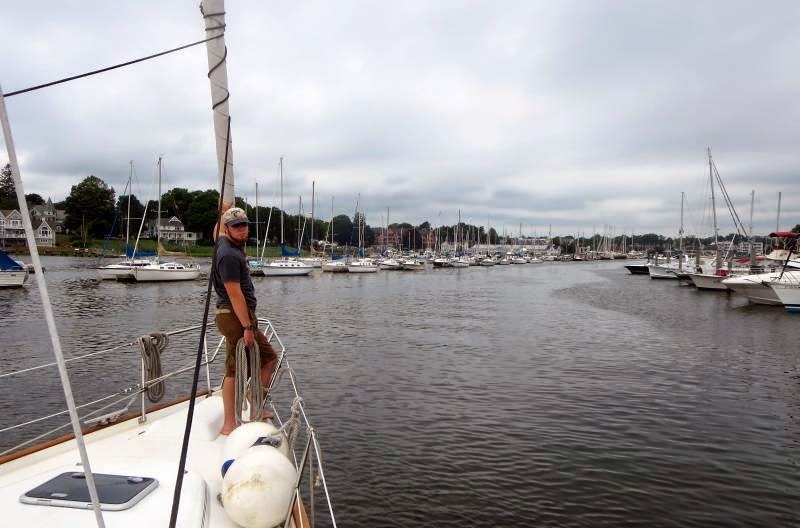 Given that we got in motion and headed out shortly after 8:00 towards the Connecticut River and North Cove. The wind was directly on the nose so we didn't get any sailing in but we did make North Cove by noon. The entrance channel is still good for 5.3 feet at low tide and inside it was 6.5 to 8.0 feet at the first four moorings. North Cove is designated a "Harbor of Refuge" and is maintained at a minimum depth for anchoring by the Army Corps of Engineers. All of this is paid for my our tax dollars and even when moorings are put in, the stipulation by the ACOE is that there cannot be a charge for transients using them if they are empty. As a signal when they're free (when no one will return for the night) they are to have a yellow ribbon wrapped around the mooring ball. Such designated moorings can then be picked up by a transient at no charge, which we did on the fourth ball in. The harbor itself has 360 degree protection and is very calm with no wakes whatsoever. 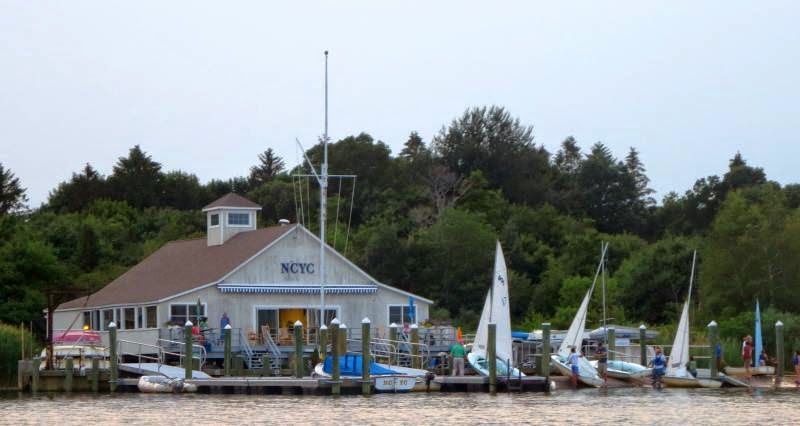 There is a yacht club there, the North Cove YC of which Frank Vinciguerra was a Commodore at one time. He was also a former Commodore of the Poughkeepsie YC. 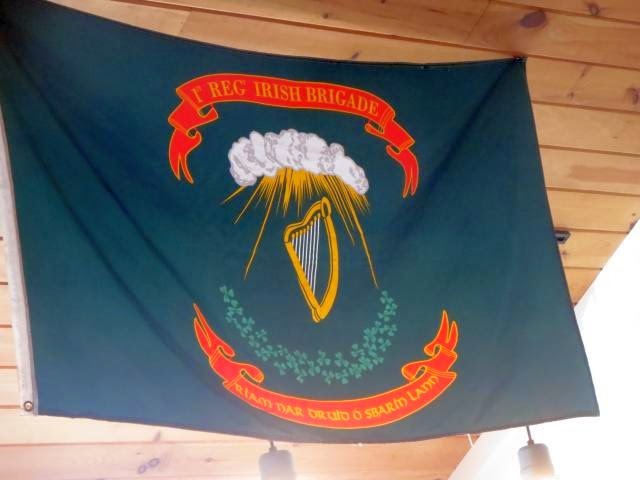 Even today many of the members have ties to the Poughkeepsie area. There is a convenient public dinghy dock at the end of the mooring area and with a short walk into town, there are shops and even a small grocery store. It's just a nice stop over. The storms are due by around 10:00 or so but we're looking forward to Thursday to see if we can sneak over to Mattituck for an anchorage, otherwise we'll just stay here another day. 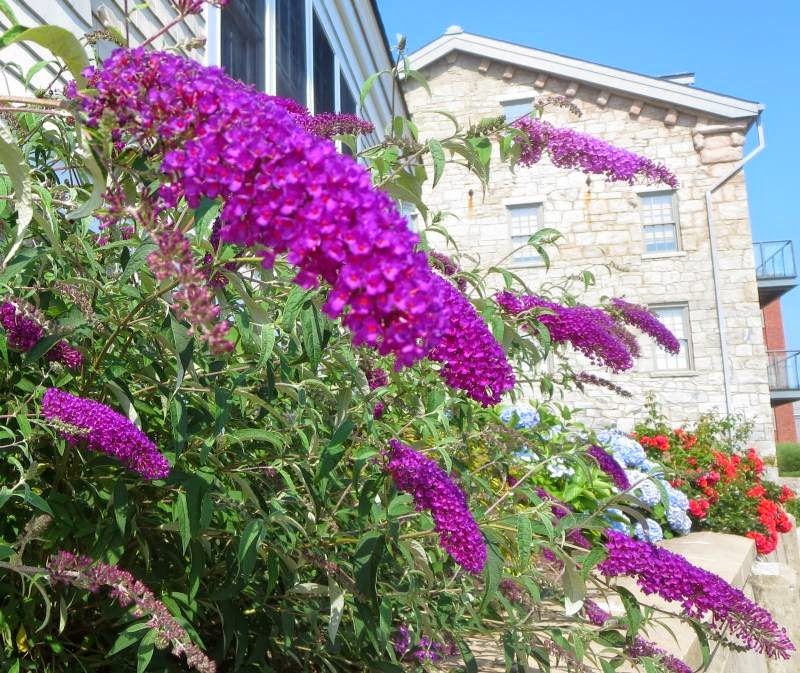 The town is alive with flowers, they are everywhere! What a great day! We set sail out of Block Island around 10:00 and made it halfway to Stonington before the wind died. The wind was never very much but it was enough at 7 kts to propel us at 5 kts northwestward. With such little wind, Block Island Sound was flat, like sailing on a lake. We just lazed along. We made it to Stonington around 2:00 and snugged in as far as we could to the western shore, trying to avoid any potential rolling action by mini-swells coming in. So far, so good. In addition to the interesting walking areas along the town streets, they have that great dinghy dock - so we're always attracted to Stonington. 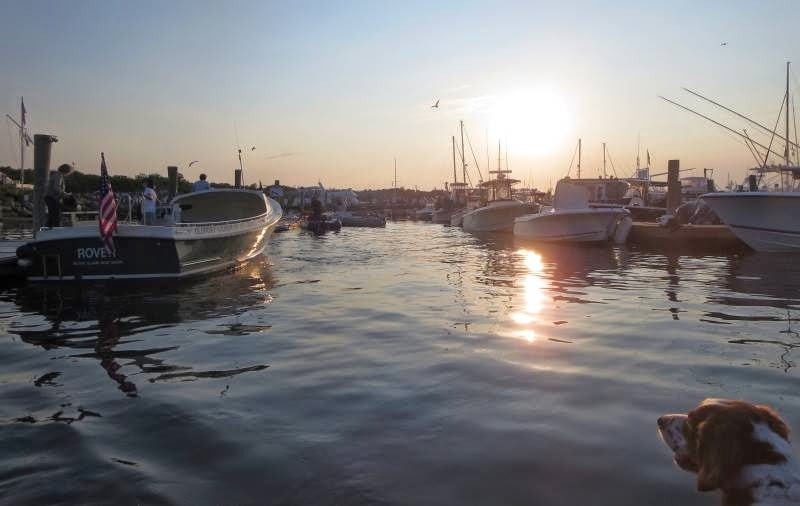 Plus, there's always something going on in the harbor like sailing dinks tonight. 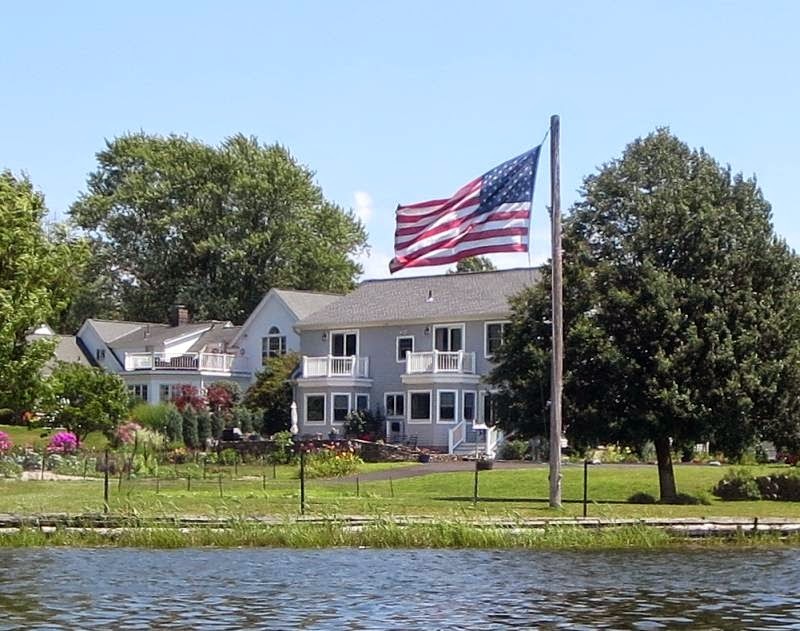 With high winds predicted for Wednesday, we'll probably stay here tomorrow and continue westward on Thursday to the Connecticut River. Everything depends on the weather as usual. The sum finally came out this afternoon after two days of cloudy skies. It actually warmed up to 70 today and now we sitting at anchor with absolutely no wind. The water is flat, good for reflections, beautiful. Even though it's not as crowded as on the weekend, there's still over a thousand boats here, at least. We toured the harbor in our dinghy just to explore the area. Taking a mooring is not necessary, there are lots of places to anchor. We visited the Oar Restaurant this afternoon for appetizers and their version of a rum punch. They have outstanding Buffalo wings and we also added a side dish of calamari which was okay but not in the class of the wings. 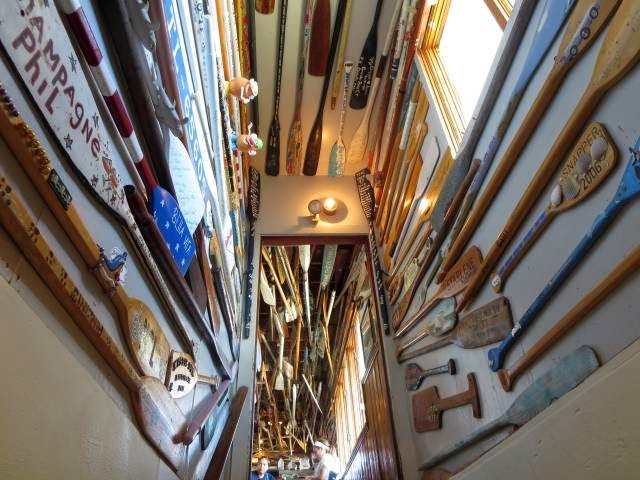 The Oar is noted for, you guessed it, all the oars that have been donated over the years and now hang from every available spot in the restaurant: ceilings, walls, stairwells, hallways, etc. They are all signed and dated to commemorate someone or some event. 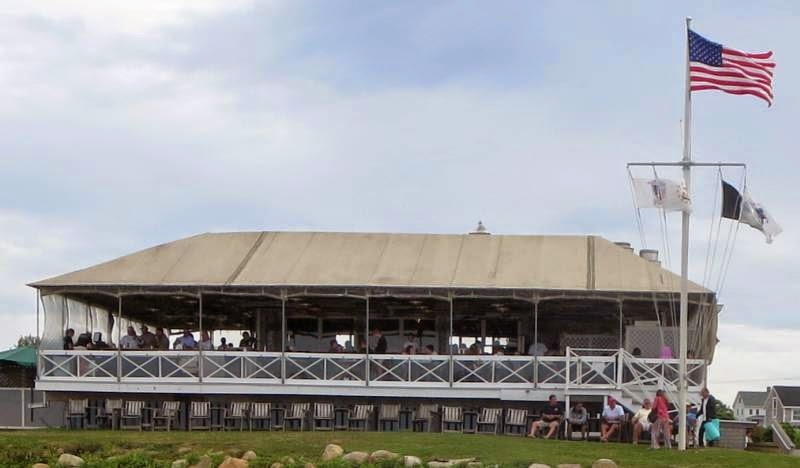 Have a lunch or dinner at the Oar on the deck with a view of the harbor is a must do activity when in Block Island! Be sure to have the wings. I think we'll head back to Stonington on Tuesday afternoon. The winds are due to pick up on Wednesday to 20 kts and kick up the seas to 3 to 5 ft waves so we would rather avoid that excitement. 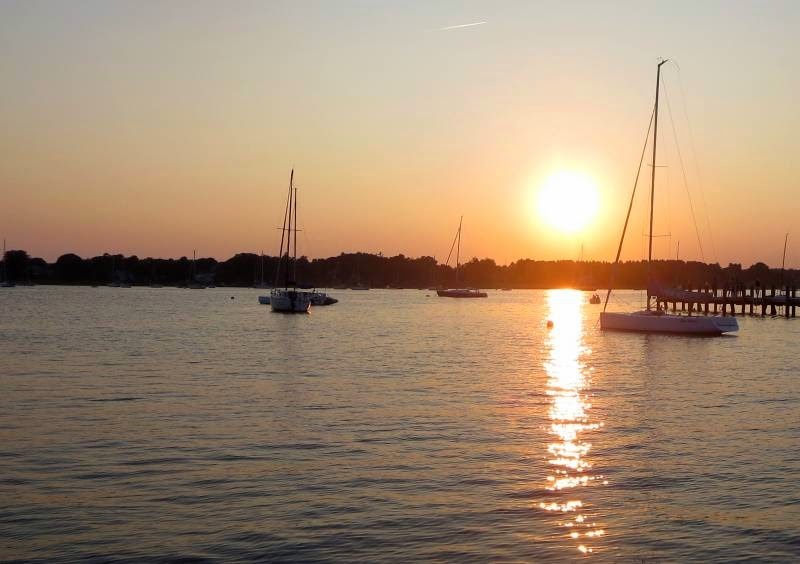 We'll anchor out again in Stonington and hope that we don't get the swells into the harbor like last time. 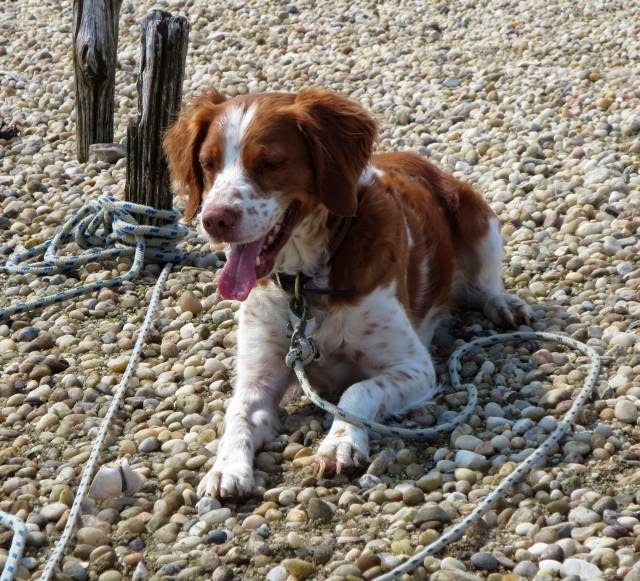 One thing you need to know about the Stonington anchorage is that if there is a swell out of the east or south along with an east wind, you will find the anchorage very rocky. You can barely see the swells coming in, they are only a few inches high but the period is such that they tune to the sailboats, causing a 10 to 15 degree rocking back and forth when they hit the boat abeam. So although the first night was very calm, the second night was spent wondering when the rocking was going to stop, it never did. So we were glad to leave Sunday morning for Block Island. We left under the threat of rain but we managed to reach Block Island in sloppy 2 to 3 ft seas by 11:15. Since it was a Sunday afternoon, we were greeted by massive boat leavings. Nice to be retired and not have to go to work on Monday. 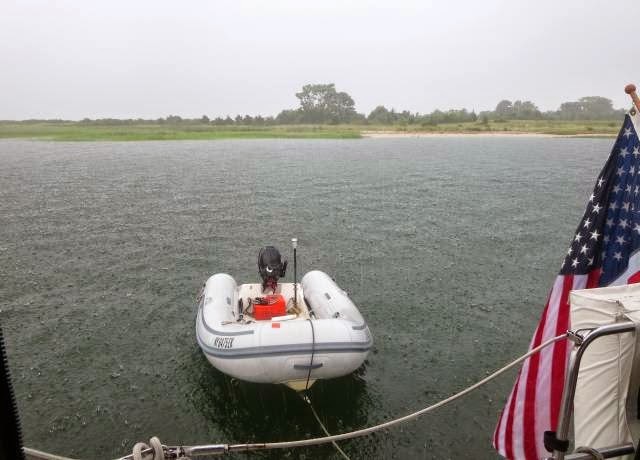 But even on a Monday there was not a single mooring free, not that we would take one anyway - we always anchor out at Block Island and save the $45/night mooring fee. There are few places that seem to be immune to economic downturns and Block Island appears to be one such place. 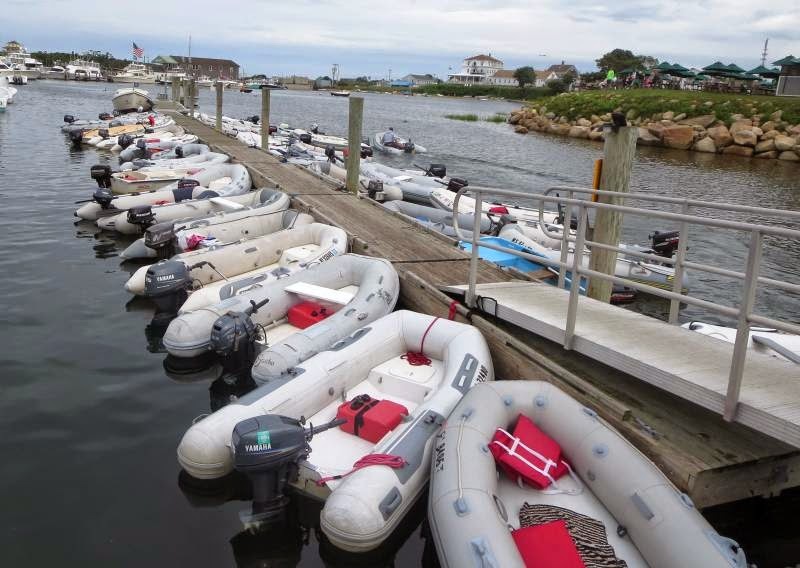 No matter what the economic climate, Block Island is always full during the summer (no free moorings!) but on this Monday it was less full than in the past so we had no problem finding a place to anchor. We didn't snug up to to the east shore so we're in 30 ft of water with 100 ft of rode out (70 lb Spade anchor, 60 ft of 3/8" BBB chain for those interested). We've never had a problem anchoring at Block for the past 15 years. We'll spend several days here, depending upon the weather and it's forecasted to be cool, only in the low 70's at best. We'll be fine in our enclosure watching the world go by. 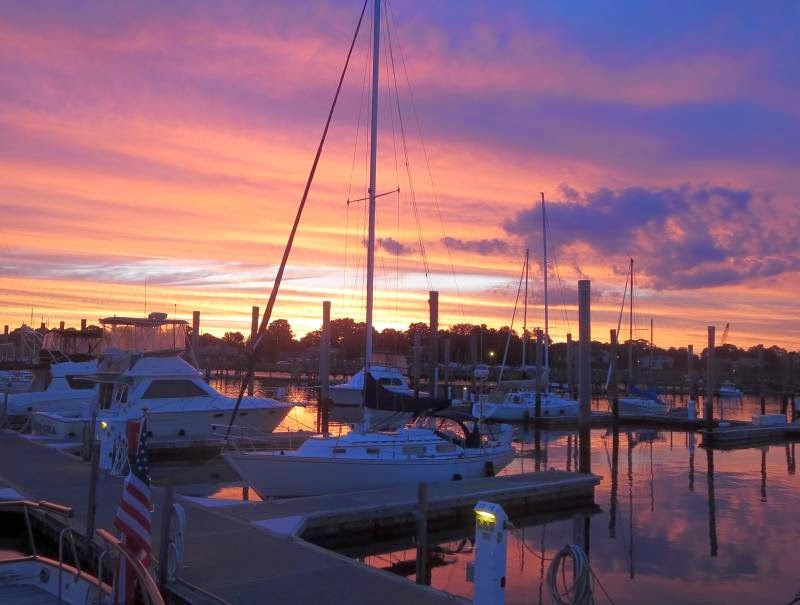 The Oar is the restaurant of choice for a view of the harbor and to get excellent Buffalo Wings. We'll go there tomorrow to see if they are as good as we remember. Meanwhile, we'll relax for awhile. A little cool today, it barely got into the 70's. In the middle of summer, I didn't think about packing a light jacket. 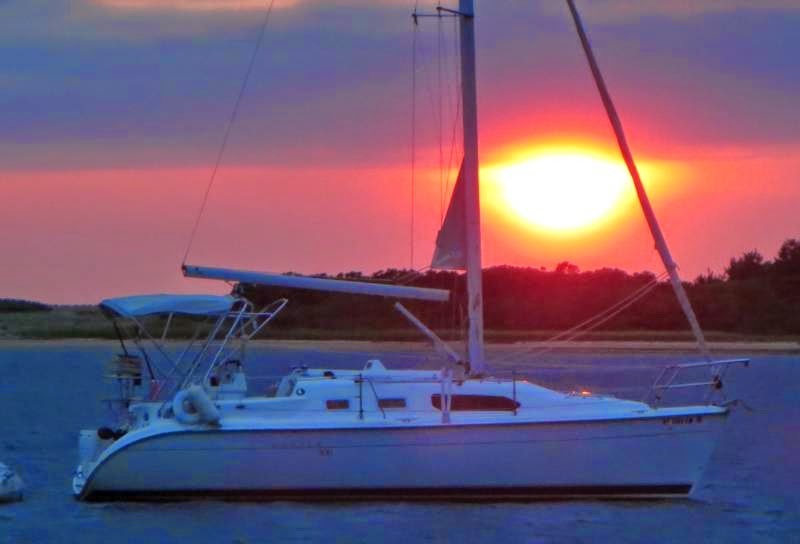 Block Island is forecast to be only 68 for a high on Monday, cooler in the morning for the trip in with Hoolie. When we left Poughkeepsie we were concerned about hot weather, unfounded so far. 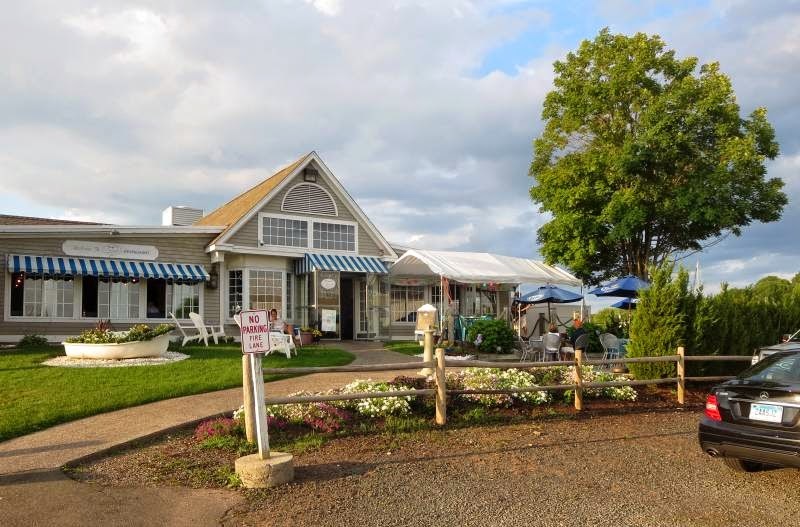 When in Stonington the place to eat used to be Skipper's but that's changed hands, Skipper's is no more. Now the crowd gathers at The Dog Watch Cafe located down by Dodson Boatyard. On weekends the wait for a table (they do not take reservations) can extend to 2 hours! Knowing this we went early, at 5:00 and still had a 20 minute wait. Once you eat there it's obvious why it's so popular. The portions are generous, the food is excellent and the service can't be beat. We had the Dog Watch rum punch (excellent, a couple each) and the calamari (plenty for two) and a lobster roll each (overflowing with lobster meat). If you're ever in Stonington, be sure to go there. We took the dinghy down to the dock for the restaurant and along the way passed at least 1/2 dozen Hinckley sailboats. Each one was immaculate. I guess there's something about owning a Hinckley - one rule being that you must keep it in top-notch shape! I've never seen a run-down Hinckley. This must also be an alternate location for the New York Yacht Club, lots of their burgees here. One other place to not miss is the Seafood Market. It's a do it yourself selection of seafood that you pick out of an open freezer and then pay for on an honor system (open 24 hrs/day). During the day there's usually someone around to help with the money. All of their product is flash frozen in vacuum blister packs, perfect for storing in the freezer on a boat. 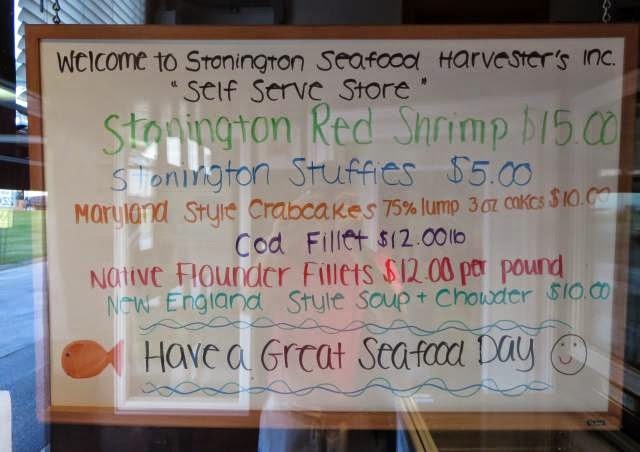 They have local cod, local flounder, local scallops and other local fish. They do offer some imported fish such as salmon from Scotland. The prices are good and they are just right for dinners on a cruise. 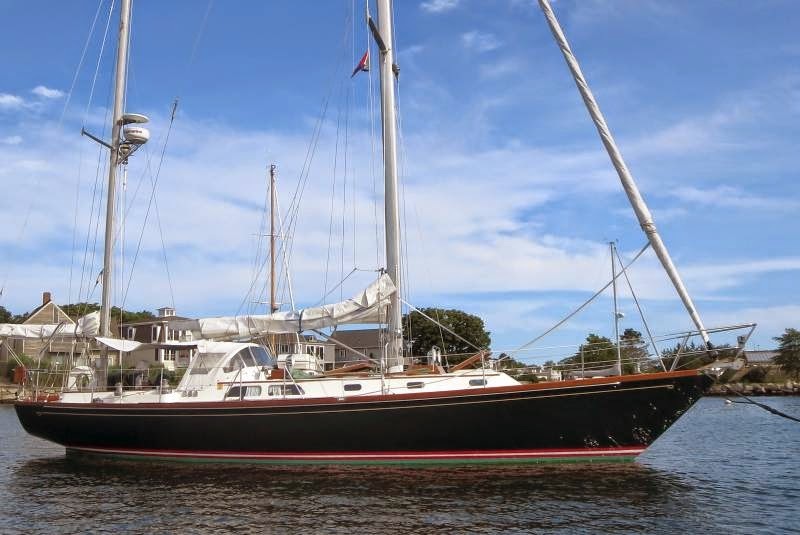 We plan on leaving Sunday morning for Block Island and anchoring out for a couple of days. It's going to be cool but with our enclosure, it will be fine in the sun. 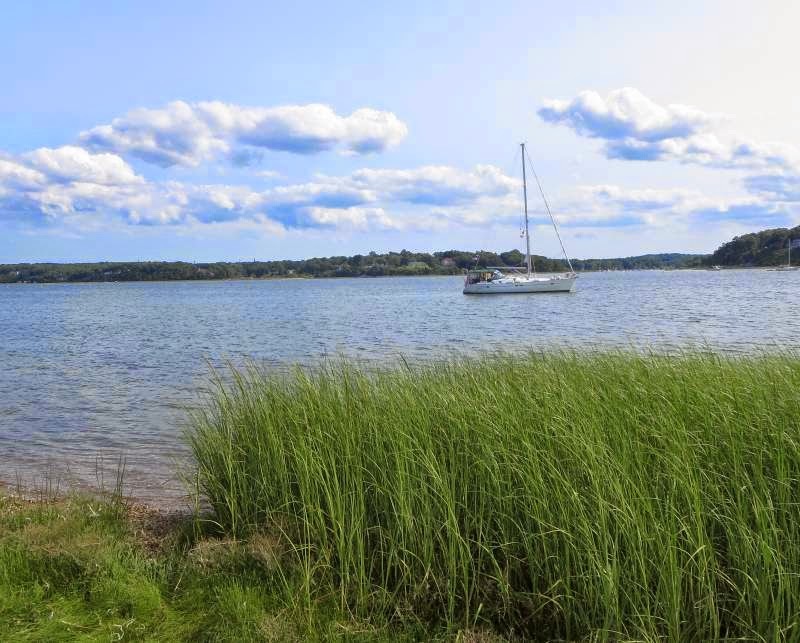 We had intended picking up a free mooring at North Cove on the Connecticut river but we made such good time that we continued on to Stonington. We were even able to sail for about an hour before the morning winds died. Meanwhile, the weather was cool and the humidity was around 50% all day, very unusual for Long Island Sound in late July but we'll take it! We're told it's from a summer version of the polar vortex that plagued the winter with extreme cold air - not so bad in the summertime. The high on Block Island is only predicted to reach 70 on Monday. Guess which ferry didn't have AIS?? Everyone else did. We dropped anchor in the designated anchoring area which was carved out of the mooring field several years ago - so the visiting boaters who didn't want a mooring could anchor for free. The area is further behind the breakwater than where we used to anchor just off the fairway. As we found a couple of years ago on our last visit, the town maintains a free dinghy dock right downtown, very convenient for visiting boaters. This place is alive with boaters, quite a contrast from Branford which looked practically dead. Here, the sailboats rule! I think I counted about a half dozen Hinckleys, beautiful boats! There is a line between the barge and tug! Do not go between them. 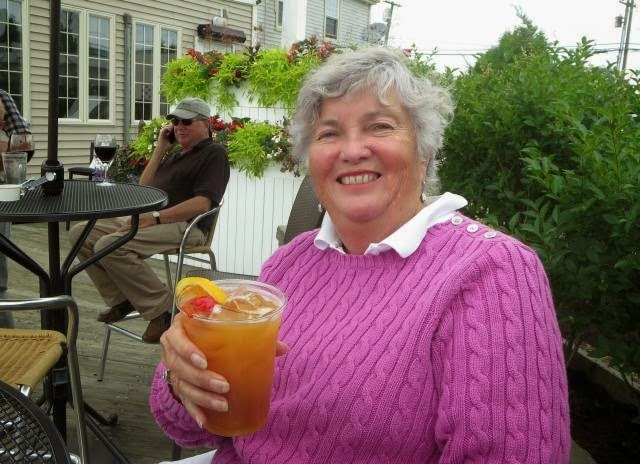 Ann volunteered to take me out for lunch on Saturday so we'll pay a return visit to the Dog Watch Cafe, the place to eat in Stonington. They have reasonable prices and the food is good. On Sunday we plan on continuing over to Block Island before turning around and heading back west. 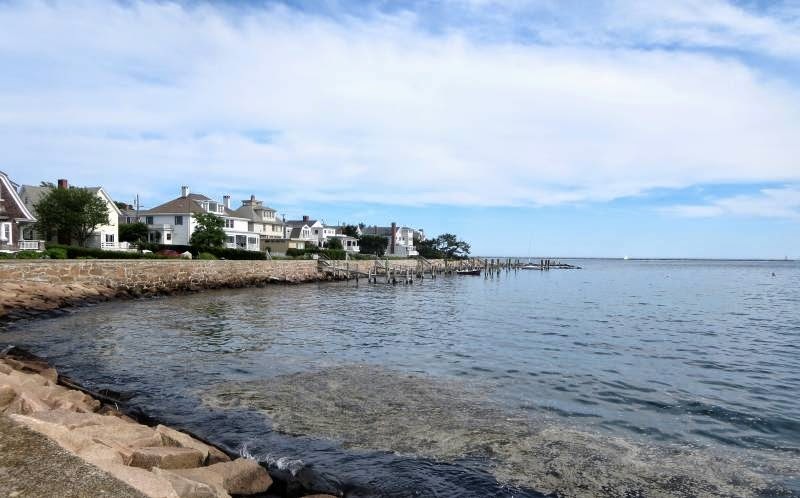 Normally we would have stayed at Branford for only one day to take advantage of Lenny's nearby but since we needed to replace the dampener on the engine drivetrain we stayed an extra day so Brian from McDonnell Marine could reach us easily on Thursday. 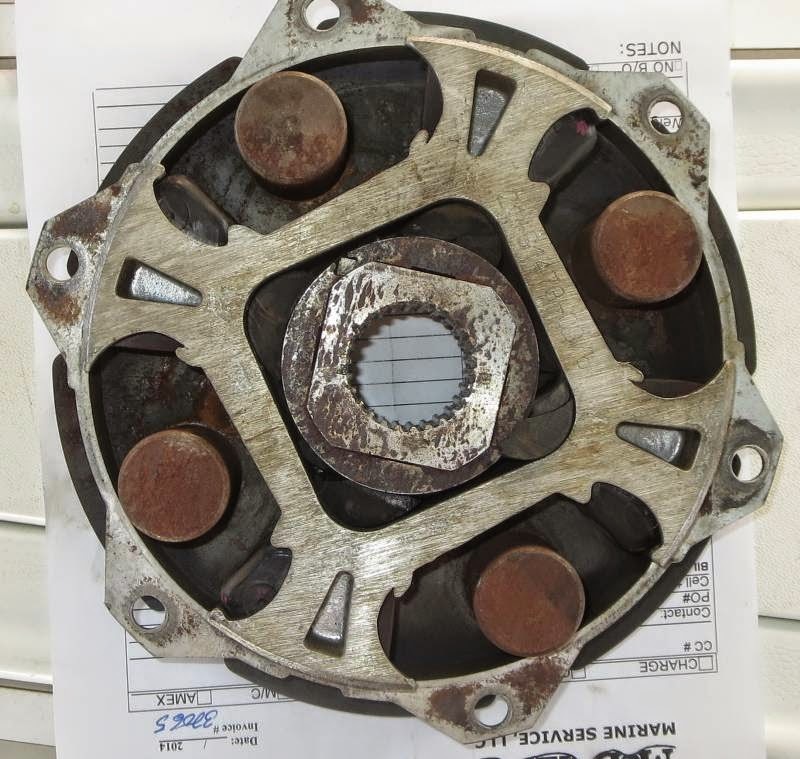 So what is a "dampener" and why does it need to be replaced? It's part of the drivetrain between the engine and the transmission. There is no clutch on a sailboat, it's all or nothing. There's no first, second or third gear, just one gear forward and one gear for backing up. There is a lot of heavy iron being driven by the engine and so a shock absorber was designed in between the driveshaft of the engine and the gearbox (which is only there to switch from forward and aft). That shock absorber is called the "dampener". Ours had seen 3200 hours of operation, a lot even for a diesel. If our sailboat engine was in a car, it would have gone 160,000 miles so far (assuming 50 miles/hour). Ours had seen its best days, the rubber cushioning was shot. So now we are all set for our trip south in September down the ICW once again. The marina here is in good shape as far as upkeep but they are woefully underutilized. I'm sure they would get more business if they only met market demand by lowering prices but I never expect that to ever happen! From here we'll probably go to North Cove in the Connecticut River for a free mooring before continuing onward to Stonington on Saturday. The winds continue to be light but the storms have all abated for now, no rain is predicted for the next several days! If all goes well, we'll mosey out to Block Island for a few days before heading back west. Storms rumbled through all last night but we were secure in our anchorage in Port Jefferson. We had to wait in the morning for the last of the storms to pass through before leaving for Branford on the south shore of Connecticut. On the way across Long Island Sound, there was no wind, well we did have 5 kts but even that was on the nose so it was a motoring day. On top of everything else, it was chilly, in the 60's. It did warm up once we reached Branford but even now at 8:30 on a summer evening it's only 75 outside. We're staying at Bruce and Johnson's Marina and it's half empty, quite a contrast compared to years past when we've stayed here. Even empty, it's still $3.50/ft - perhaps that's a contributing factor. 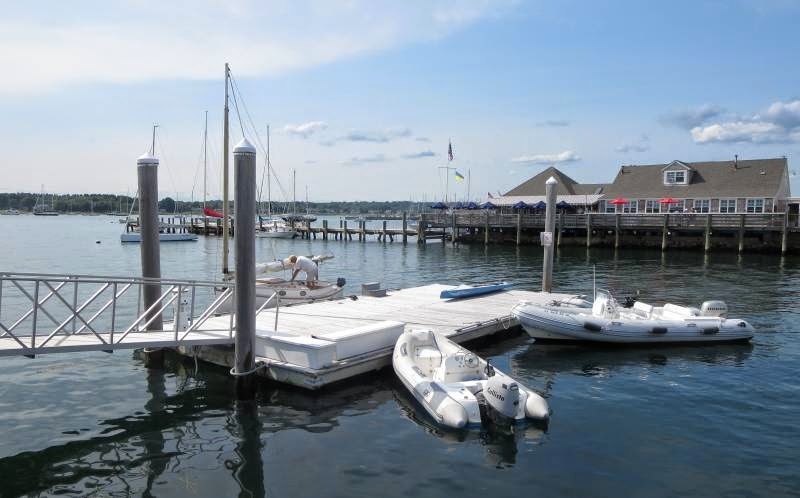 The marinas are finding out that they can't just charge anything they want but reducing a price is worse than a root canal for some of these owners. However, they are now offering 25% off for all visits after the first stay. The primary attraction of Branford and the reason we come is Lenny's. We are a fan of fried clams. Not the kind you find frozen in supermarkets or even at most restaurants - we favor the "full belly clams". It's the whole clam, everything inside the clamshell. They are very sweet, nothing like "clam strips", ugh. They are very hard to find outside of New England and even there many restaurants don't carry the full belly kind. Lenny's does a fine job, not greasy at all and cook just right, they've had a lot of practice so they get it right. We're due for some engine work too which we scheduled for Thursday from McDonnell Marine. There's boat cleaning for our crew of grandkids arriving next week and other odds and ends so it will be a busy day. 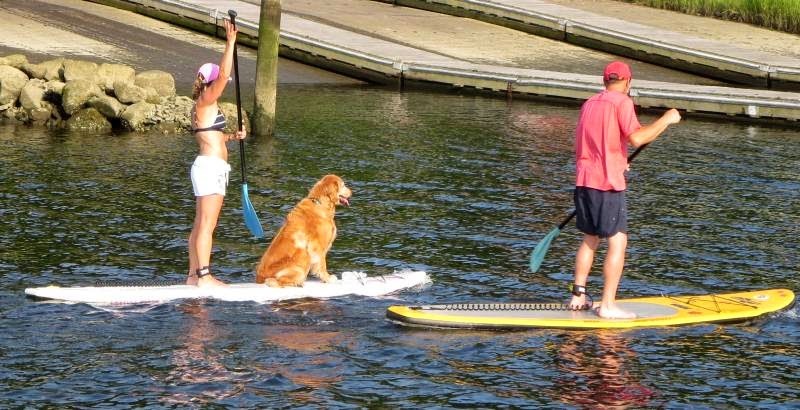 There is always something to do on a boat. We stayed over today in respect to the forecast of heavy thunderstorms throughout the day. Actually, we didn't see any storms until 4:00 pm but we're currently under a line of storms headed our way. They appear to be ready to last all night long. Oh well, we're anchored well along with three more boats that came in this afternoon. One of the boats was Lionheart captained by Bill Spencer and Bill Washburn. They paid us a visit around happy hour and we invited them to dinner. 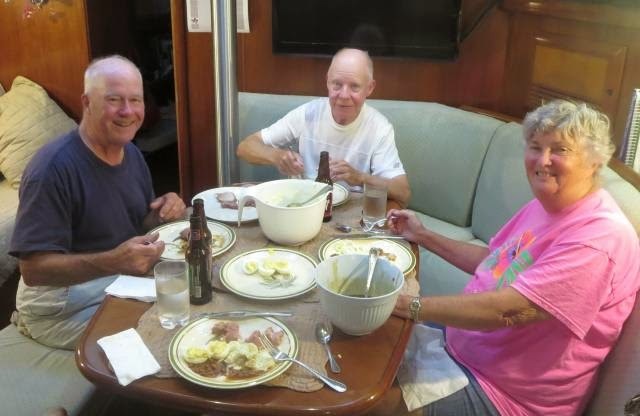 It is really great to meet friends on the water and enjoy the company of fellow cruisers. We spent the day just relaxing and fitted in some work on the outboard (oil change, new spark plug), the boat requires attention now and then. We went from being the only boat in the entire anchorage to being one of four, not very crowded. The moorings were still empty. They take up a lot of space with not much use. The storms seemed to be delayed somewhat into Wednesday morning instead of ending Tuesday night so we'll look at the radar in the morning and decide on our departure time for Branford. We may not leave until the afternoon. Depending on when we arrive, we'll do Lenny's that afternoon or wait for Thursday. There is a standing joke on Long Island Sound that the average winds are 10 to 15 kts. In actuality this means the winds are either 0 to 5 kts or 25 to 30 kts for an average of 10 to 15 which is never experienced. So just like the standing joke, yesterday was 25 to 30 kts and today was 0 to 5 kts on our way to Port Jefferson. Now we can say that our winds have so far been 10 to 15 on average! I'm sure that Tuesday will bring one of the two extremes as summer thunderstorms roll through the area. With that we're ensconced in our favorite anchorage in Port Jefferson and will sit out the storms. 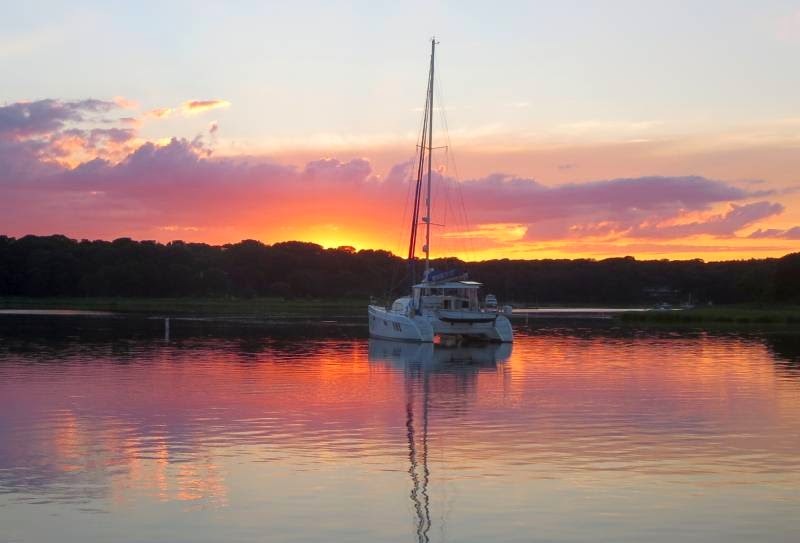 We are amazed that we are the only anchored boat in the entire Port Jefferson west harbor! This is the middle of the summer cruising season and yet we're all alone. Looking at the extensive mooring field of at least 100 moorings, there are only three occupied!! I guess the cruising life style is under attack by the economic conditions? 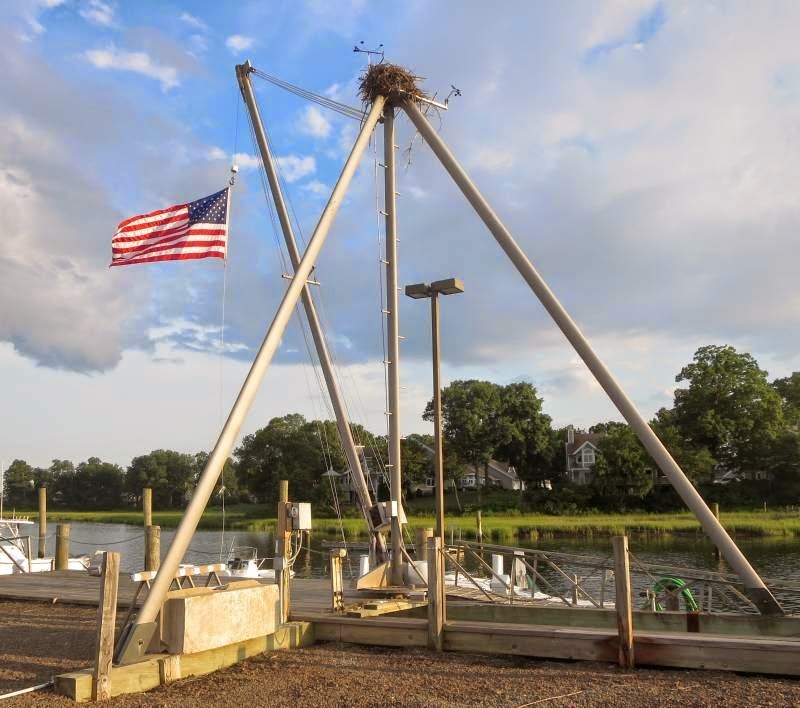 Tuesday is predicted to be a day of storms so we're prepared to sit tight here on our anchor for a day before heading off to Branford on Wednesday and Lenny's. Even then we supposed to get some storms along the way but we'll see if we can dodge them.